Other folks have covered aspects of this past weekend at Fort Ticonderoga, leaving me with little that needs adding but much to look into. Portraying a British servant is more intuitive for me than portraying an American: the hierarchy of the British is more explicit than the American, especially in a military context. We mimic the British structure, and while I considered that running a fort’s servant set might/should/would mimic that of a Big House, I wonder if that’s true. How did a set of servants from different places, answering to different masters, interact? What kind of rivalries developed? And who had ultimate below-stairs authority? It’s been a long time since I experienced workplace politics, so the past weekend gave me much to ponder about how the lower sorts managed– and managed up. For me, the name of the serving game is managing the people you serve to make your own life easier. 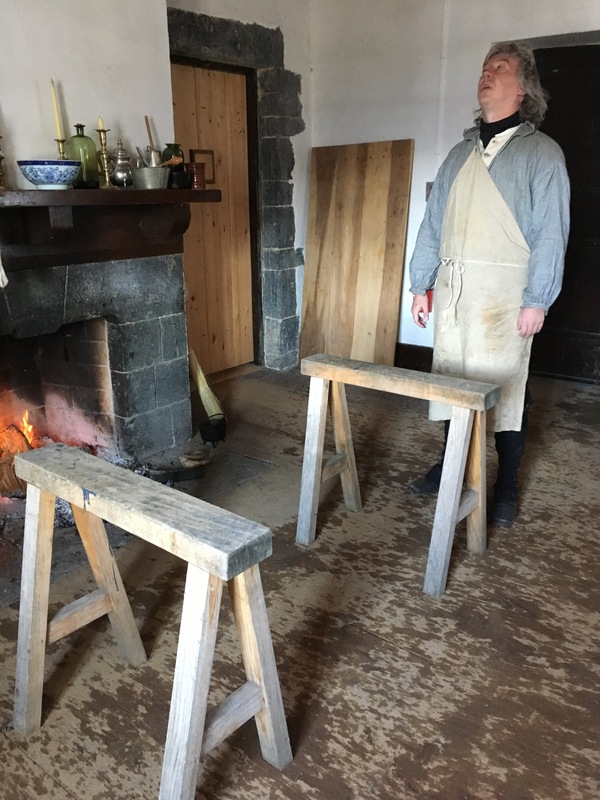 Servants had so much to do– as many of us do in real life– that the only way to manage the workload was to– well, manage the workload, or at least the person who set it. 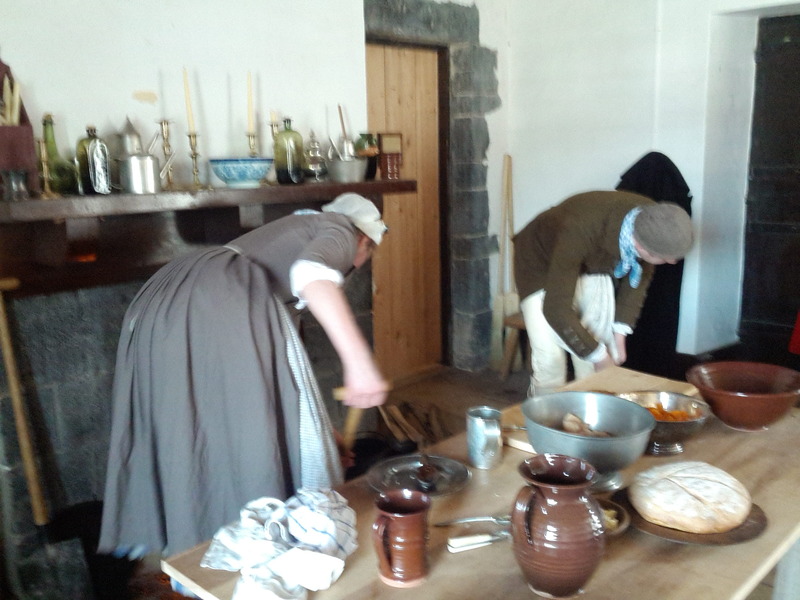 As John Brown’s housekeeper, I ran a household of several (three+) servants and six residents. Even a household that small required extensive stair climbing and coordination, even without a working kitchen! The Browns never had more than three or four household servants we could document, which again makes me wonder about the actual number of servants a complement of New England officers would have. Ow. That’s what my face means. Pierre was a trooper. Thus far, I’ve found good quantification of servants in Philadelphia households in 1775, but have yet to crack the code on New England or Continental Army servants, so more hours on JSTOR await. No matter what one ultimately decides the research shows about the number of servants and their roles in an American occupied fort, I know I spent the day more immersed than I have been in a long time. Fort Ticonderoga provided a picturesque backdrop, and my body provided a four-dimensional pain experience reminding me of the tribulations of women in the <cough> period </cough>. I spent the majority the day (the part I was awake, anyway) experiencing the full joys of being female and still fertile. The more I read about archaeology of the 18th century, particularly in the privies and trash pits, the more I think nearly everyone in the past felt pretty awful most of the time. If that hunch is correct, I nailed Saturday despite appearing in undress (which I can at least document to Sandby at Sandpit Gate). Not inaccurate or badly researched history, of course, but the “Mad, Bad, and Dangerous to Know” kind of history. Without wading into the murky waters of canceled reenactments (not my time periods– yet!) and the politicization of historical facts, I advocate the recreation of the “bad” people of history. Not the Hitlers and Himmlers and Stalins and Amins, but the everyday bad. The lazy. The feckless. The annoyed. The I’m-just-now-waking-up-to-the-bad-choice-I-made. The Female Orators. Printed for Jno. Smith, No. 35 Cheapside, & Robt. Sayer, No. 53 Fleet Street, as the act directs, Novr. 20, 1768. I think about these people– the ones who slack off while working, the ones who steal shirts, assault officers, throw bones out of barracks doors— periodically, especially when an event is being planned. It’s not that I don’t want to work, mind you: I enjoy working, even the cleaning and scrubbing of history. But it strikes me, especially in summer, that we approach the recreation of history with such excellent intentions. We will Do Our Best. We will Lend A Hand. We will be Always Cheerful. Why? Why do we not represent the people who shirked? Why do we not represent the people who resented being told what to do, and when? Why do we not take into account our industrialized notions of labor (shifts, clocks, production levels( when we step backwards into a period where there was no factory whistle to set the pace? Granted, within a military environment, there are rules, regulations, clocks, and enforcers. But I cannot help thinking that the pace of labor, the speed and drive with which people tackled tasks, was different one hundred, two hundred, three hundred, years ago. Of course there were strivers and doers: the American army in the Revolution was populated by adherents to piety and discipline. But it’s clear from the orderly books that there were miscreants and slackers, too. And I’m not saying everyone should be a slacker, but you know as well as I do that every workplace today has a slacker or two: the long-term federal employee who watches football at work; the retail clerk whose breaks last a little longer every time; the shelver in the library who catches a nap whilst shelf reading. There are consequences (usually) for those (in)actions, and that’s kind of the point. The slattern and the slacker of history throw into higher relief the purpose of the discipline an army (or housekeeper or master cabinet maker) is trying to maintain. When we all strive to do our best, we lose the depth of interpretation that doing “bad” history can provide. With 400 miles between us, Drunk Tailor and I have few chances to explore the past together, so I was both delighted and nervous when he agreed to join the British Garrison 1775 event at Fort Ticonderoga as one of Captain Delaplace’s servants. Even better, we were also joined by the itinerant Deep North Yankee who wandered around the Fort (possibly seeking roofing shingles, of which he is much in need). Friday nights are always magical, candle and firelight (and only the warmth of the fire) as we drink cider and talk about history. But morning always comes: Saturday, cold and clear, Mr S and I woke and blinked across the room at each other, and I wondered to what degree I really wanted to ever crawl out of bed…only hunger and an eventual need to pee (and fear of a Sergeant) propelled me. Yup, you cook ’em on a board. First order of business: breakfast. Mr S, supplied with his corn meal of choice, made us johnnycakes, which provided perhaps more interpretive than nutritive value. Still, they were warm and tasty and he is the only person I know who can make them; my efforts end up as FEMA disaster sites. Captain Delaplace’s servants were tasked with cooking for his mess, so Mr S and I got a start. We had a chicken, an onion (I traded onion # 2 for some bacon), butter, carrots, potatoes, a butternut squash, salt, and some port. I don’t know where this English serving woman of 1775 encountered mis en place, but she accidentally introduced coq au vin to the Captain’s table with the dinner meal. The Captain and his Lady dined on chicken braised in butter and bacon with root vegetables in a port sauce; we servants waited until they were done before we could eat. (Confession: I need to eat a lot, and have a sensory overload problem, so when visitors fully crowded the room, I had to dash across the parade ground for a Clif Bar and an Ativan before I could continue to wait for my dinner.) 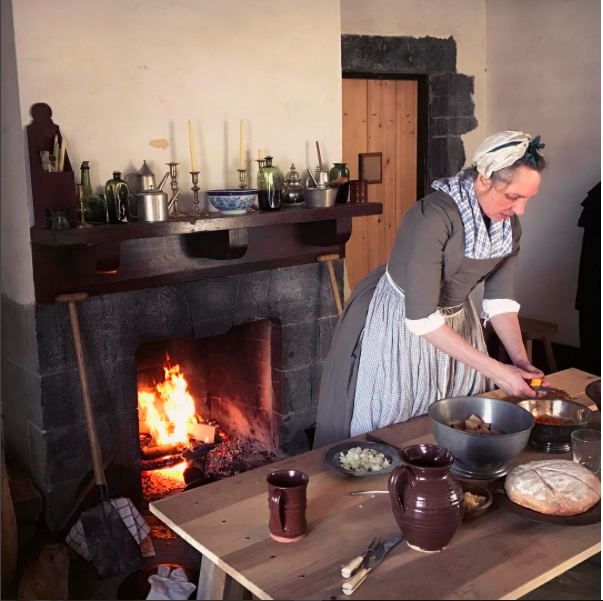 In the afternoon, dishes were washed at the table, as was common (at least in early New England), dried, and set away, while the Captain’s lady and child played in the cabbage patch between the beds. 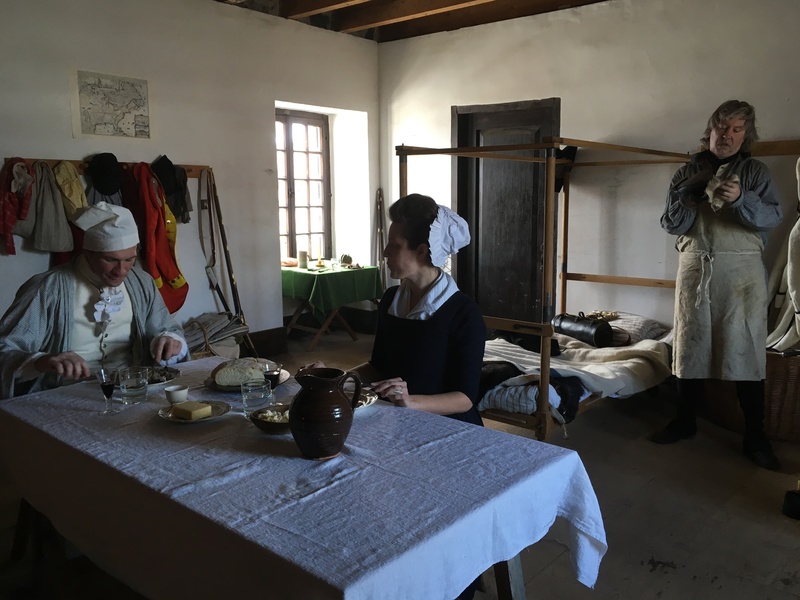 When the room was empty, servants were able to eat (huzzay!) and found the meal very tasty indeed. I would certainly make this again, and learned more about cooking– a typically female task I generally try to avoid– than I had expected to. Then we had yet another round of dishes before it was time to tidy the room and make ready for tea or supper. To that end, we cleared the table and broke it apart to reveal the floor and hearth, which needed to be swept of bread crumbs, squash peels, dead leaves, and other detritus. 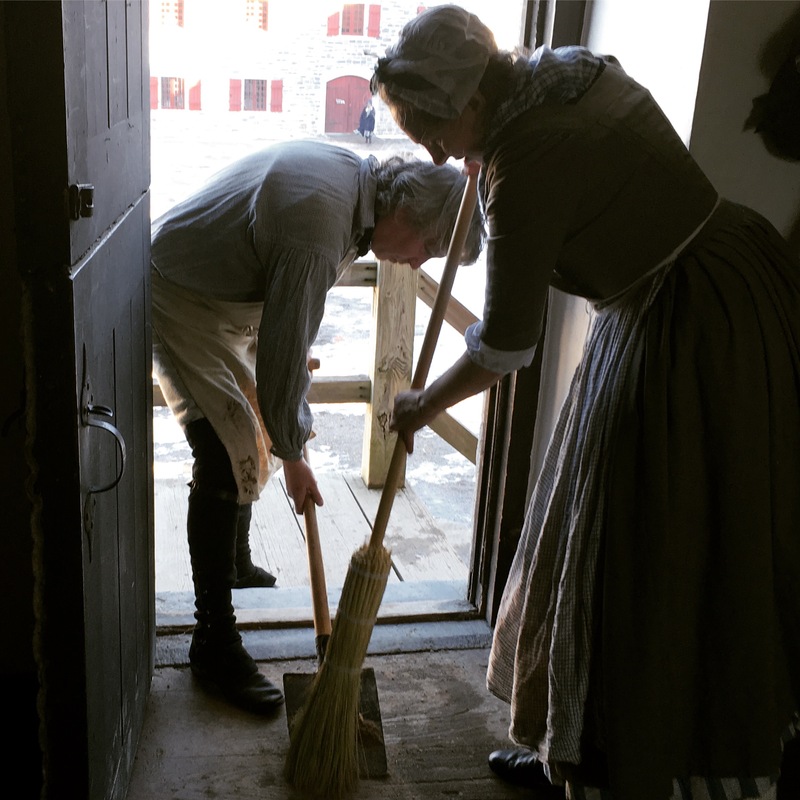 The best way to sweep an unfinished floor in the 18th century (per Hannah Glasse et al) is to strew the floor with wet sand and then sweep. I mixed sand with lavender-infused vinegar and threw it on the floor; this keeps the dust down as you sweep months of dust and dirt out of the corners and from behind tables and chests. When we were done, we restored the table (Drunk Tailor noticed the height of the ceiling, and wondered about hanging birds in cages whist awaiting the return of the tabletop), fully reset with cloth, candlesticks, plates, and knives, ready for the supper we didn’t cook, as we skipped away at the close of the day to find our own meal in Glens Falls, where live music is inescapable on a Saturday night. The dirt on Fort Ti came home on my shoes. And my petticoats. And my gown. And possibly my face, which could explain the reactions I got when I stopped for gas on the Pike Saturday evening. It’s incredible how how dirty, dusty, and straw-filled a room can get– and that’s just the officer’s room. For all I know, a horse had been sleeping in the back corner of the barracks room we cleaned– who else would leave so much straw? Regular readers know I have a thing about portraying women’s work in the past, as well as historical cleaning methods and what I like to call “experimental archaeology” and other people call “that crazy hobby- thing- where you get cold and dirty.” We started with mop making, of course, and when I loaded the car on Friday morning, I was pretty well pleased with my swag. So, what happened? How did it go? What did we do? Our Girl History provides a descriptive photo essay overview of the day. My experiences were more limited, as befits someone of my status: officer’s servant. Every good experience begins with a meal. Friday night supper included bread, cheese, pork loin and apple, imported from Rhode Island. Yes, I also helped myself to bacon, to ensure none was wasted. Bedtime for officers’ servants comes early: I’m not a stranger to rope beds, but found this straw tick far more comfortable than a previous arrangement elsewhere. Start in one corner…don’t stop! After formation, to tasks. I was ably assisted by Miss Sam, who was a better height for the brooms than I. The brooms are speculative on the one hand, and later on the other. The corn broom was markedly more effective than the broom straw, which disintegrated with use, though not for lack of care in making. We were up against some serious accumulation. 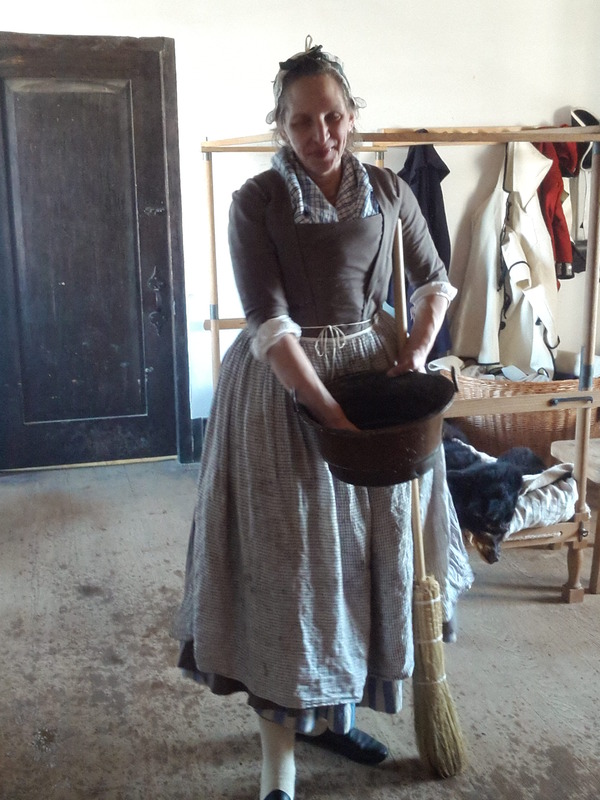 Housekeeping and servants manuals from the period, like Hannah Glasse, tell you the cleaning must be done every day. It’s certainly something I heard within my own lifetime, though an ideal I continually struggle to achieve despite the advances of Mr Kenmore. The general rule is to begin at the top and work your way down: gravity is, at last, your friend. I use brushes– a large, soft round paint brush and a stiffer circular whisk– to remove dust and dirt from upper surfaces, and cobwebs from corners, and other wall-borne detritus. 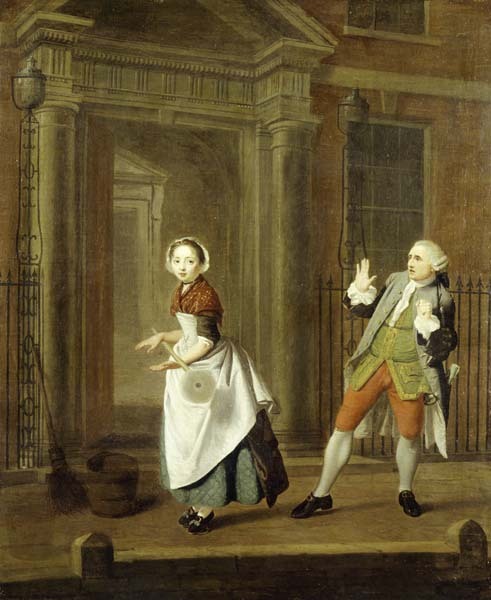 Gentlefolk: your cleaning ladies know much about you in any century. After sweeping (yes, into the fireplace or out the door, it’s that simple), scrubbing. I scrubbed the baseboards first with vinegar and water (the vinegar infused with lavender for several years). Filth, my friends. Then we mopped. Again, filth. I would have preferred to do another dust collection on the floor– the water did pool a bit on the dry dust that remained, but swabbing seemed to work and I believe we left the floor cleaner than it had been. The three mops we tested (wool, cotton, and linen strips) each had benefits and deficits. The cotton and wool caught on the rough floor boards, but did a good job spreading water around the floor and lifting dirt. The linen strips were better at not catching and at scrubbing. No matter what, the water got filthy and took on the look and nearly the consistency of the chocolate we drank that day. Remember the iron museum rule: don’t lick it! That rule applies everywhere. Everyone and everything got cleaned Saturday. Miss V broached the laundry with vigor, but discovered that possibly untoward things had been done in her laundry tub. Things that might involve shoes, and blacking. Marks were left on shifts and shirts, so even the wash tub got a scrub this garrison weekend. Some of the best comments came after the fact: I’ve never heard cleaning called “one of the coolest things” seen all day, but when someone says it helps them see a space in an entirely new way, I’m incredibly happy. There’s so much about the everyday use– and maintenance– of space and objects and each other that we take for granted in our own lives. Surely the people of the past who had servants took all that work for granted. But for me, enamored as I am of details and of the quotidian, transforming a space through the everyday work of women is a job with doing. Thanks to Fort Ti’s staff for giving me the chance to step back in time and enjoy (really, I mean it) a day of hard work bringing the mundane back to life. Unless otherwise noted, all photos by Eliza West, courtesy of Fort Ticonderoga. I haven’t dropped the peddling question, I promise! But I’m busy writing a paper for this coming weekend’s women’s history conference (yes, I know: but I’ve read that procrastination fuels creativity, so those digressions into the Canton voyage of the Ann and Hope were totally worth it). If you’re curious about the process I go through developing characters for living history programs, or best practices for women of the Revolutionary War-era armies, among other topics, there are some tickets left, and you can register online here. 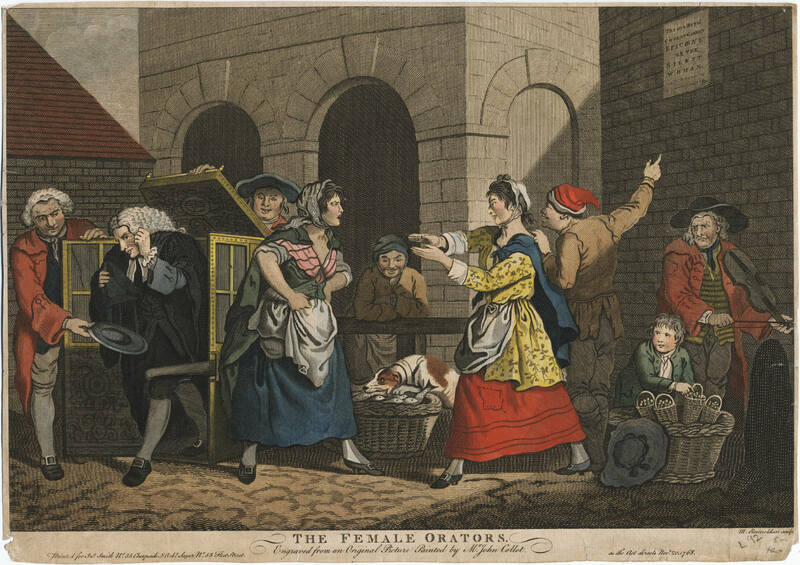 But before I can compile what I’ve found about food markets in 18th century Boston, I have to go back to writing for this weekend. Those Providence servants don’t research and describe themselves, and the housekeeper is particularly unreliable.